It is with great sadness we send this note to all members and friends of The Fashion Group International of Minneapolis/St. Paul. A dear friend to many and supporter of our FGI Minneapolis/St. 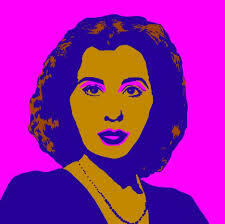 Paul region dating back to the early years of our founding, Margot Siegel has passed away at age 91 in Miami, FL. "A lot of fashions end up being more important historically than in a fashion sense. They tell you what we were like at that moment in time." We are grateful for her passion, love and contribution to the fashion industry. Funeral service FRIDAY, February 27, 12 NOON, TEMPLE ISRAEL, 2324 Emerson Avenue South, Minneapolis. In lieu of flowers, memorials preferred to donor's favorite charity. NO SHIVA. Margot had a lifelong fascination - "combining the worlds of fashion and art." That describes Siegel's predominant interest as a collector of such world- renowned artists as Andy Warhol and Robert Rauschenberg. 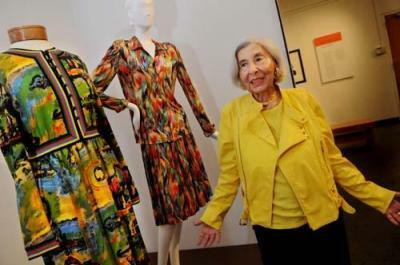 Donating much of her fashion collection to the famed Goldstein Museum of Design at the University of Minnesota, she now enjoys showing guests favored art pieces she saved for her Florida home. A career woman before the 1970s feminist movement, she became an editor and international correspondent for Women's Wear Daily after World War II, and later served as a public relations director for Walker Art Center in Minneapolis, next-door neighbor to her high-rise apartment where she continued writing for the Minneapolis Star-Tribune and as the arts and fashion columnist of Skyway News, a downtown newspaper. Her love of fashion included amassing an eclectic mix of accessories and wardrobe items that have become period collectibles, from a Stephen Sprouse design of a Louis Vuitton handbag to an early Warhol sketch of a high-heeled shoe. This priceless treasure trove of fashion fascinated curators of the Goldstein Museum when viewing potential acquisitions from the Siegel collection that include a Takashi Murakami design with a Vuitton "Cherries" coin purse. "Important art can be accessible - it doesn't have to be mysterious," says co-curator of the Goldstein exhibit, "Intersections: Where Art Meets Fashion," that displayed fall of 2009, Barbara Heinemann, who wrote her dissertation on Siegel's life history in clothes. Today, famous artists and designers jump at the chance to work for Target and HM. But in Siegel's heyday, the connection between art and fashion was more tenuous, with the art world often dismissing fashion design as frivolous. Peering into Siegel's closet reveals the association that was always there, even before the two camps were ready to celebrate it. "A lot of fashions end up being more important historically than in a fashion sense," Siegel says. "They tell you what we were like at that moment in time." Margot Siegel in her 20s.